Anti-Parasite Drug Ivermectin Could Be New Weapon In War Against Malaria-Carrying Mosquitoes : Goats and Soda That's what researchers wondered as they look at new ways to stop the spread of malaria. A new study reports on the impact of ivermectin on skeeters. 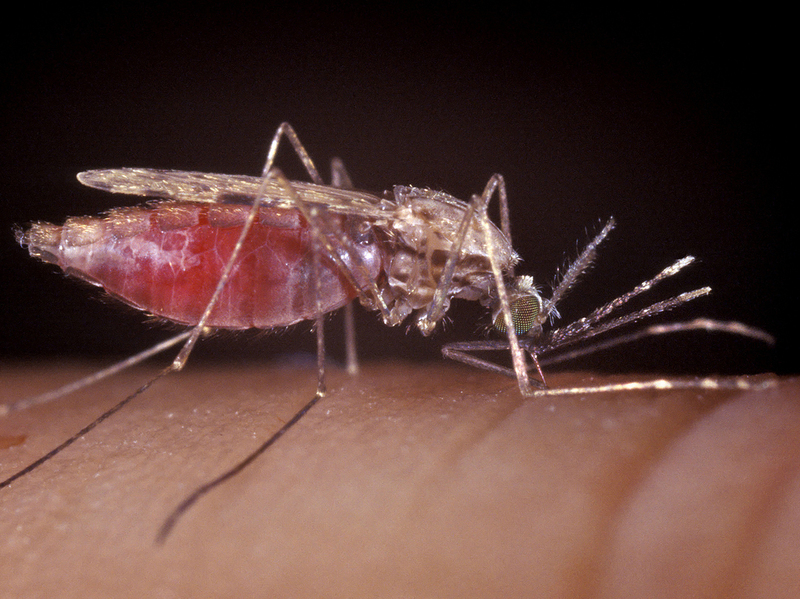 The female Anopheles mosquito is a spreader of malaria. Imagine this: A pesky mosquito sips some of your blood. Hours later, the blood-sucker drops dead, poisoned by the very blood it just slurped down. That may sound too good to be true, but it's a tantalizing possibility, according to research published this week in the journal The Lancet Infectious Diseases. The study points to a potential new tool to fight malaria: the medication ivermectin. Studies conducted in the 2000s, including one in 2010, show that malaria-carrying mosquitoes die after feeding on individuals who have ingested the drug. Malaria is a mosquito-borne infection that affects more than 200 million people worldwide. The disease is transmitted when an infected mosquito bites an individual, spreading a parasite called plasmodium. In humans, the parasite can cause fever, headache, chills and even death. Despite years of eradication efforts in developing countries, growing research shows malaria-carrying mosquitoes are becoming resistant to the insecticides meant to wipe them out. "Since 2015, the number of annual deaths from malaria has stabilized," says Menno Smit, MD, a Ph.D. candidate at the Liverpool School of Tropical Medicine who led the new study. "We're not making any more progress. We need new tools, and ivermectin could be one." Ivermectin was developed in the early 1980s as a drug to fight parasites that cause river blindness and elephantiasis. Smit and his colleagues hope it can also help eradicate malaria. In their study, the researchers demonstrate that three high doses of ivermectin make human blood deadly to mosquitoes for at least 28 days after the start of treatment. This high dose of ivermectin was also well-tolerated with few side effects. "The most exciting result was the fact that even one month after [the subjects took] ivermectin, their blood was still killing mosquitoes," Smit says. "That's much longer than we thought." To reach these conclusions, researchers at the Jaramogi Oginga Odinga Teaching and Referral Hospital in Kenya gave 47 participants 600 micrograms of ivermectin in tablet form for three days in a row. Blood samples were obtained from these participants six times and then fed to mosquitoes in cages. "We put the blood in an artificial membrane that mosquitoes could bite on and then watched," Smit explains. "Most died within a week after [drinking] the blood." Two weeks after feeding, 97 percent of the mosquitoes had died. Another group of 48 patients were given a dosage of 300 micrograms but the mosquito death rate was not as high. Either dose is higher than usual. More than 2.5 billion ivermectin treatments have been distributed since 1987 for the treatment of parasitic infections, typically one annual dose of up to 200 micrograms. In this study, Smit says the high dosage of 600 micrograms for three days was well-tolerated. Participants reported few side effects, though he admits everyone in the study was already hospitalized and receiving treatment for malaria. "The patients may have noticed less side effects because they were already feeling sick," Smit explains. "We have yet to see if the excellent tolerance we saw would be just as good in healthy individuals." Smit adds that the high dose of ivermectin still needs to be tested in children to ensure that it is safe for all ages. Dr. Peter Hotez, who was not involved in the study and is dean of the National School of Tropical Medicine at the Baylor College of Medicine, says bigger studies need to be done before ivermectin is seriously considered as part of a national malaria control program. But "I think ivermectin has potential as a supplemental strategy for malaria control and prevention," Hotez wrote in an email to NPR. "The drug has an excellent safety track record from its use in mass drug administration campaigns in Africa." Hotez warns that, though ivermectin is an exciting possibility, there is the potential for mosquitoes to build drug resistance. That's why a vaccine is still needed, he says. Dr. Regina Rabinovich, a malaria scholar at Harvard University who was not involved with the study, agrees that ivermectin is worth pursuing to help fight malaria — as one more "imperfect tool" in the global arsenal against a "tricky" disease. In a separate commentary on the study, Rabinovich writes that "more than one approach will probably be needed to confront this challenge [of malaria]." Perhaps new drugs that have a similar effect on mosquitoes can be developed that have a longer lasting effect, she says. In an email to NPR, she stresses the need for trials in an area where malaria is rampant — and reminds people that researchers need to make sure that by killing mosquitoes, ivermectin can also decrease transmission, too. Nadia Whitehead is a freelance journalist and a science writer. Her work has appeared in Science, The Washington Post and NPR. Find her on Twitter @NadiaMacias. Editor's note: The original version of this post wrote that ivermectin is used to treat the disease "elephantitis." Several readers noted that a more commonly used term for this condition is "elephantiasis." We have updated the post. An earlier version of this post incorrectly stated the dosage of ivermectin in milligrams. The correct measure is micrograms.